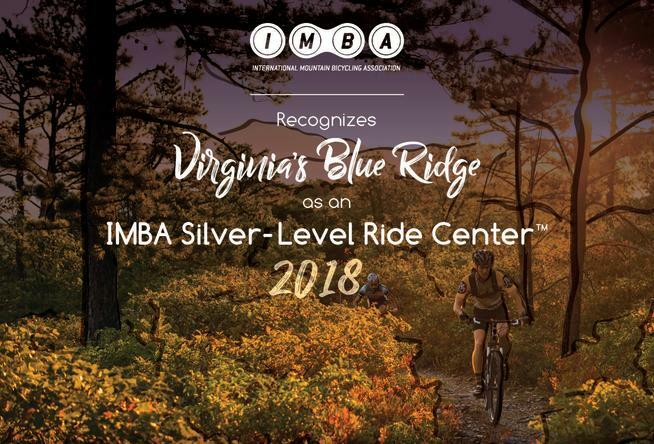 "America&apos;s East Coast Mountain Biking Capital"
Virginia&apos;s Blue Ridge has been awarded a Silver-Level Ride Center designation by the International Mountain Bicycling Association (IMBA) elevating this region to a whole new level as a mountain biking destination. David Wiens, Executive Director of IMBA, made a special trip from Colorado to officially announce the Ride Center™ designation. Wiens stated, "Virginia&apos;s Blue Ridge IMBA Silver-Level Ride Center status solidifies the enthusiasm for mountain biking along the East Coast and puts Virginia on par with some of the greatest mountain bike destinations. 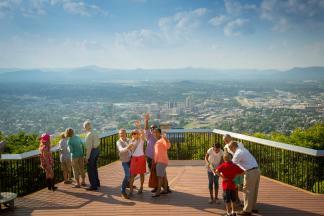 We look forward to the many ways Virginia&apos;s Blue Ridge will thrive with its new Ride Center designation." The designation did not happen overnight. "It took nearly two years of hard work by many people throughout Virginia&apos;s Blue Ridge to get to this point. This announcement is a real game changer," stated Lee Wilhelm, Chair of Visit Virginia&apos;s Blue Ridge. The Ride Center application criteria served as a blueprint for achieving and improving the trail systems. "We see it as a catalyst for increased investment in our current trail systems, and it will help develop new trail projects similar to those at Explore Park as well as throughout Virginia&apos;s Blue Ridge," said Kristine McCormick, President of Roanoke IMBA. With only fifteen Silver-Level Ride Centers in the world and the only Ride Center on the East Coast, we are ready to stake our claim as "America&apos;s East Coast Mountain Biking Capital." The growth and expansion of mountain biking in Virginia&apos;s Blue Ridge will attract biking enthusiasts of all levels to experience a Metro-Mountain Adventure though the variety of trails and destination amenities. See Ride Center Fact Sheet for more details.